The music you choose for your special day can make a strong and lasting contribution to its overall impact, memories for all. 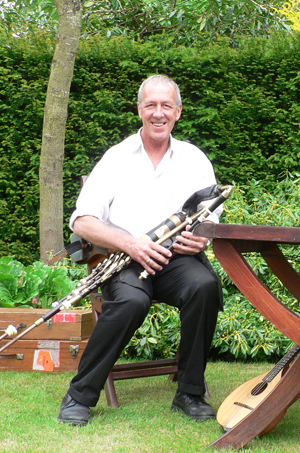 The particularly poignant sound of the Uilleann Pipes can evoke powerful emotions to form a unique background for your enjoyment and happiness.. If you have a particular song or air that you would like please contact me and I will aim to comply with your request. We can perform a selection of subtle, faster moving jigs, reels, hornpipes along with mazurkas, waltzes and airs according to the atmosphere and ambiance you wish to create. Ceilidh / Wedding evening gathering. Why not consider a ceilidh after the reception with ‘Tripping Upstairs’ Ceilidh Band. For more information please check our 'Tripping Upstairs' page.